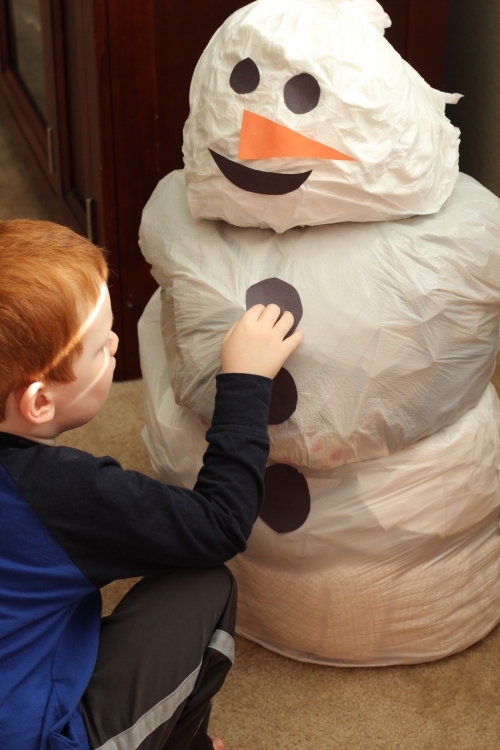 We haven’t had enough snow to build a snowman outside, so we decided to build a snowman indoors. 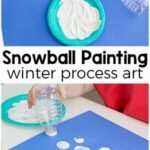 If you don’t have snow where you are at, you can still have a blast making one. 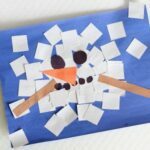 This active art project will add tons of winter cheer to your home! 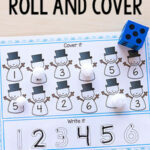 This week the Playful Preschool theme is snowmen. 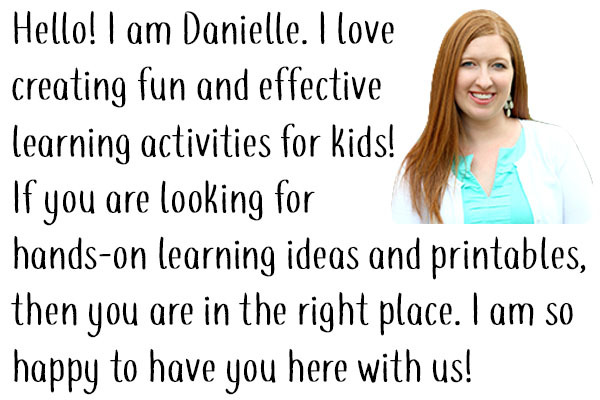 The team has a bunch of fun learning activities planned. 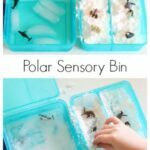 Check them all out at the bottom of this post! 1. Draw 2 small circles for the eyes on the black paper. 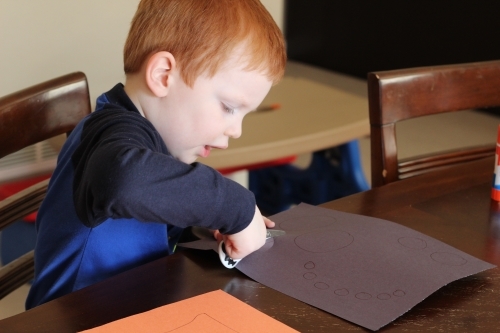 Draw 3 large circles for the buttons on that same paper. Draw a mouth on the black paper as well. 2. Draw a carrot for his nose on the orange paper. 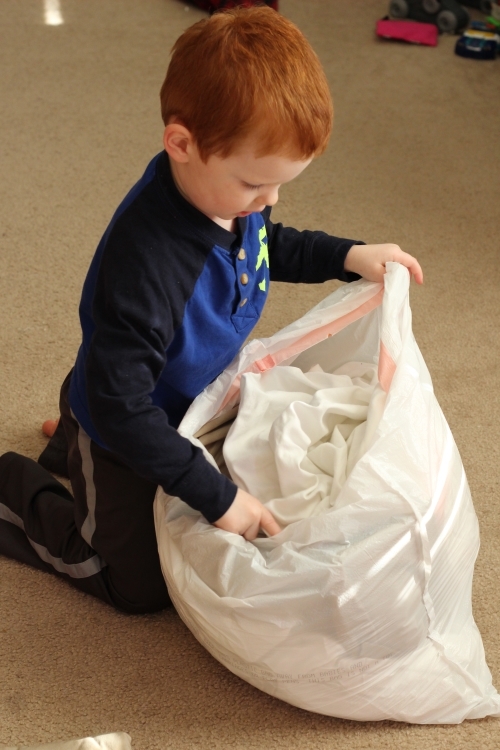 1.Stuff one garbage bag with blankets or towels until it is almost full. Tie it closed and put it on the ground. 2. Stuff the next garbage bag until it is about half full. Tie it closed and place it on top of the garbage bag that is already on the ground. 3. Stuff the last garbage bag until it is about 1/4 of the way full. I just used one sheet. Put that on top of the other two garbage bags. 4. Have your child cut out all of the circles, the carrot nose and the mouth. 5. 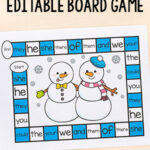 Your child should use a glue stick to put glue on all of the pieces and then stick them on the snowman. 6. Add the arms. I used two pieces of flimsy cardboard and attached them with paper clips. 7. Add the scarf and hat. 8. 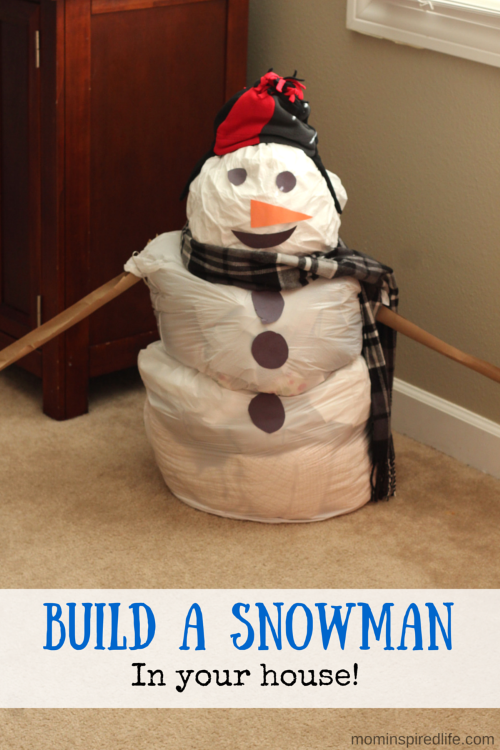 Step back and admire your super cute snowman! 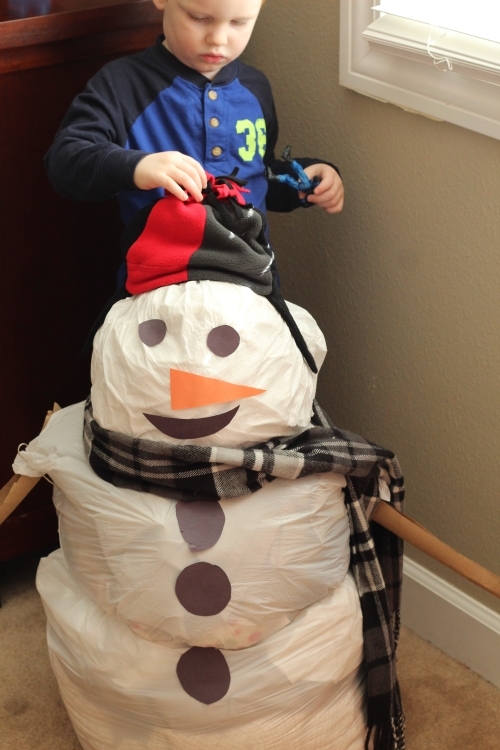 Evan had so much fun making this snowman. He even named him Super Snowman. He is very proud of his work and couldn’t wait to show his Dad when he got home. Super Snowman is still sitting in the corner of our living room and we’re enjoying his company!